Beyond Salmon: Let's go shopping! Not that kind of shopping -- fish shopping :) Over Thanksgiving I had a chance to organize my thoughts on the topic of buying fish. Sorry this is a bit long -- I guess I had a lot of thoughts. This little shack looks like it’s about to fall over. Is it safe to buy fish here? Is it bad that it smells fishy? What if the fish is not fresh and will make me sick? My recipe calls for “striped bass” and they don’t have it – help! How much fish do I need for 2 people? What on earth is “sable”? Does that sound familiar? The worst part is that fish is not cheap, so buying an unfamiliar fish at $15/Lb might seem a bit risky. But luckily, I had an ally in my quest to buy and cook fish – the fishmonger. I couldn’t have had a better introduction to bluefish. The success of my first venture beyond salmon helped me trust Mike and encouraged me to be nosy in fish markets. The amazing thing is that I never seem to run out of questions and the fishmongers never seem to tire of answering them. Here are some questions you can ask your fishmonger to break the ice. If they are reluctant to answer them, consider going to another fish market. Q: When did the fish come in? A: A competent employee of a fish market should know (or be willing to find out) when a particular fish came in because it’s essential for telling you how long you can keep it before cooking. “Yesterday” is a perfectly good answer. Fin fish (unlike shellfish) is fresh for about 1 week after it was caught. Q: How long can I keep it before cooking? A: Fresh fish can be stored for at least 2 days in the fridge before cooking. If the fishmonger says you can only cook it today, the fish was stored too long at the fish market. Q: What is this fish like? A: A good fishmonger tasted most fish she sells. She should be able to give you a description of the texture, flavor, and fat content. Q: What are some good ways to cook this fish? A: If you are new to cooking fish, asking fishmonger for recommended cooking methods can steer you away from a disaster of grilled sole or poached swordfish. If you are in a mood to grill or in a mood for a light dinner of simple steamed fish, don’t hesitate to tell your fishmonger. They’ll often be ready with a great recommendation. If the fishmonger can answer all those questions with confidence, you know you are in good hands. You’re more likely to encounter expert fishmongers in small Mom and Pop shops than in chain supermarkets, but you never know. Mike was a fishmonger in a regular Boston supermarket chain. 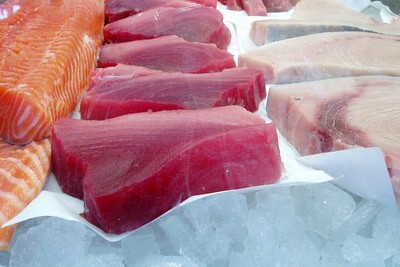 Many supermarkets have excellent fish departments, particularly organic chains like Whole Foods. The trouble with non-organic chains is that they can be extremely inconsistent in the quality of their fish department from one store to the next. It all depends on the manager of their fish department, not on the brand of the supermarket chain. This brings us to the topic of what a good fish market looks like. Here is a check list you can use to evaluate the fish market. The market should be well lit so that you can see the fish well. All steaks and skinless fillets should be stored on cookie sheets or parchment paper set on ice. They should not come in direct contact with ice so that their flesh is not damaged by melted ice. Large fillets with skin, like a whole side of salmon can either be stored like skinless fillets or placed directly on ice since the skin creates a barrier between the flesh and ice. All whole fish should be buried directly in ice. Since they have the skin to protect them from water. The fish should have a very mild smell or none at all. You can ask the fishmonger to hold out a fillet so that you can smell it. If you don’t feel comfortable doing that, smell the fish when you get home. Whole fish should have clear eyes and bright red gills without any brown discoloration. There should be no gaps between the flakes of fillets (except for the center of the fillet where the pin bones were removed) and fillets should be glistening and feel firm to the touch. You can ask the fish monger to press the fillet with their fingers. If the flesh doesn’t bounce right back and you can see the indentation where the fingers touched the fish, the fish was mishandled. If you don’t feel comfortable asking the fishmonger to do that, check the fish when you get home. Monday is not the best day to buy fish. Fish markets do not get deliveries on Monday because fishermen don’t fish on Sunday. Even in the best fish markets, the selection of fish on Monday is likely to be smaller than on other days. It’s perfectly safe to buy and eat fish on Monday, but I don’t recommend keeping it until the next day. After talking to several fishmongers in the Boston area, I found out that this "don't buy fish on a Monday" rule no longer applies. Some fish are actually delivered on Mondays. It all depends on where they are coming from. Since fin fish stay fresh for about a week after they are caught, it's perfectly reasonable to buy them on any day of the week. Word of mouth is the best way to find a good fish market. Ask your co-workers, neighbors, and friends. If you like fish dishes at a local restaurant, ask the chef for advice. Any recommendations for buying fish in the arlington/belont/cambrigde area ? I appreciated your comment about fresh fish on Mondays, I live in Paris and have just spent an hour cycling around the city looking for fresh tuna, no luck but I had a good ride. If anyone out there knows of any fresh fish markets open on Monday please let us know. Biking through Paris -- how wonderful! I wonder if Monday is still a pretty quiet day for fish markets in Europe. Good luck finding the tuna and let me know what you end up cooking out of it. Do you have a preference for a fillet versus a steak of fish? My favorite fish are salmon, wild salmon, and arctic char, if that makes a difference. Whether I buy fillets or steaks depends on the cooking method, but I don't have a strong preference, and they are really inter-changable. Generally, fillets give you more portion control since you can ask your fishmonger for any amount, and then cut that fillet into pieces of any size. So for salmon that is fatty and juicy in any form, I usually buy fillets. This also allows me to crisp the skin if I am searing it in a hot pan(which doesn't happen with steaks). For halibut, on the other hand, I prefer to buy steaks (since all the fat is clustered around the bone) when I am grilling, broiling, or pan roasting. This way it stays juicier. If I am poaching or steaming halibut (wet cooking methods), I go with fillets for convenience. Try both fillets and steaks, and you'll develop your own preference. Good information, especially the Monday shopping which I always hear. I'd like to add a link to a great page by the Monterey Bay Aquarium that helps us protect over-harvested fish while we shop so we can help them make a comeback. I love Chilean Seabass but commercial fishing has devastated their numbers and unless we seafood lovers make sound choices we will all be eating farmed salmon with food coloring added. You can select your list by region and even print out a wallet sized card to take with you to the market. Thanks for the Monterey Bay Aquarium link. It's a great resource! Well written. Thank you very much for a simple yet helpful article on buying fish. okay. i'm fifteen, and i'm young... does that limit my post rights? no, just joking. but i'm fifteen, anyway. thanks, anyway. again, this was REALLY helpful. now i can walk into the fish market with my 'rents and not feel out of place anymore! Thanks for coming to visit Beyond Salmon! What is H.E.? And what's the report on it? This is a really informative blog, thanks for all your help! Helen, I am a fishmonger here in Austin, Texas. I just stumbled across your blog and wanted to tell you how accurate it is. Good work! I love it when I find folks educating the public on the joys of fish. I bought a salmon yesterday, and I got the butcher to marinate it. It's wrapped up in paper and it's in the fridge. Is it still ok to eat it now? How long can it still like that for? you can definitely eat it even if it was marinating over night. it's not a safety issue, it's a taste issue. most fish don't need a long marinade and in my opinion most fish need NO marinade. if the marinade has an acidic ingredient, it will start cooking fish and turning it opaque. that's how ceviche is done (citrus cured fish), but if that's not the intention, you might want to ease up on marinates. Delicious fresh fish is available during the summer at farmers markets in bedford, lexington, newton, arlington and brookline. During the winter it is available on Fridays at Busa Farms (52 Lowell St, Lexington) between 1 and 5.
that quote is from bourdain's kitchen confedential, am i right? i stumbled on your website by chance trying to find out how to tell if the sea bass i bought today was done. I am a complete foodie, future chef, and in love with seafood. for such a long time i've been wanting to move beyond salmon and halibut but most grocery store chains seem to have a fairly poor selection of different types of fish. i went to the farmers market today and discovered an oasis - fish i'd never eaten before, fish i've never heard of, shellfish, whole fish, giant fillets. the sea bass i bought was a successful experiment of gutting and cooking a new type for the first time. I'm looking forward to enjoying your website as a guide to new seafood adventures!